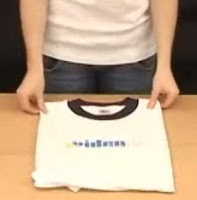 Many lean trainers use a folding t-shirt game to teach standard work. I posted a video before showing some ninja t-shirt folding which I've seen used for lean training. T-shirt folding is great exercise for lean training. It's simple and doesn't require any special material besides a t-shirt. Everyone's familiar with this basic article of clothing and, in general, most people hate to fold laundry. Why not show everyone a more efficient way to perform this mundane task? And if you want to reward your team, let them keep the t-shirt at the end of the training. 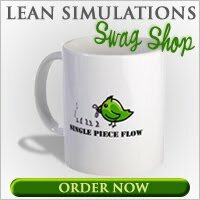 Heck, why not splurge and buy some real lean t-shirts with incredibly witty slogans on them! (Disclaimer: I designed that shirt, so only positive comments, please). Recently I found a few other videos on t-shirt folding and I wanted to update the whole t-shirt folding phenomenon. Watch it directly on youtube here. The second one gives more details, including precisely where to draw the line with your hand, instructions on where to pinch the shirt and how to cross your arms and shake it. If you can't see the above video, you'll have to head over to youtube and watch it there. So what do you do with these videos? After having a few laughs and struggling with your group's terrible folding techniques, use a stop watch and time everyone folding their t-shirts simultaneously. Develop a standard work for t-shirt folding. Isolate each of the job elements and go through the instructions step by step. Then time your group again. The results will clearly show the benefits of standard work. You can't argue with data! Well, you can, but you'll probably lose. There's a few additional standard work examples on my previous post on the subject, but I've also found this comprehensive presentation on standardized work and TWI. The presentation includes a job breakdown sheet for the t-shirt folding exercise on page 47. So, get your people together, head for the laundromat (or boardroom) and get folding! And then tell us about it in the comments below!